There is never a dull moment in Personal Finance, am I right? I am not sure if it’s just me, but I am constantly think of ways to look at personal finance through different perspectives and lenses. A while back I took a stroll down memory lane to figure out how long it would/had taken me to earn my first $1M in earned income. That analysis got me wondering how much earned income Mrs. GYFG and I had earned on a combined basis (I will share shortly). But ultimately the reason I wanted to see how much we had earned as a team was to figure out how efficient (or inefficient) we had been at converting our income to wealth (i.e net worth). I can’t say for sure if this ratio is original thought or not, but it has been circling in my head for months now. 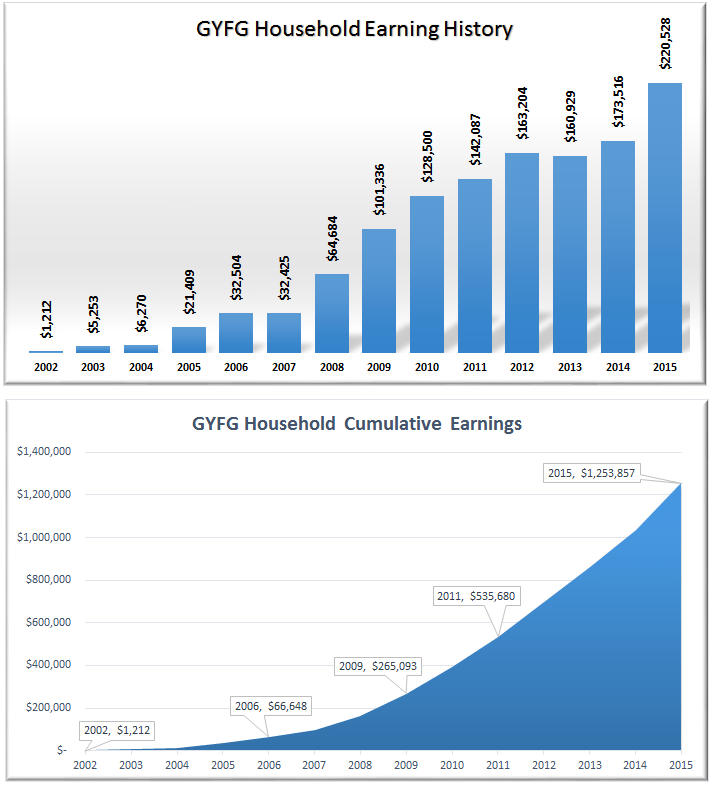 Before we get into the ratio and all that good stuff, let’s first cover lifetime earnings for the GYFG household. First, if you ever want to go back in time to figure out what you have earned the Social Security website has made that really easy (assuming it was on the books). If you read the post I linked to above you would recall my earnings went back to 2003 (at least the ones for a formal employer). My wife has me beat by a year with her first year on the books in 2002. I couldn’t believe how much money we had already earned, and we are only barely entering our prime earning years. Based on how much we have earned, I was a bit bummed on how little of that we had converted into wealth. Note: This excludes any form of rental income from our condo and from renting out a room in our house. It also excludes any windfalls like gift money. I explicitly point this out in case you have an eye for detail and notice that the numbers here are slightly off the annual income figures I report on my monthly reports and financial stats page. The short of it is to expect discrepancies, earnings for this exercise will be lower that total income reported. My first thought after my first reaction…How much of that have we turned into net worth? My second reaction…F*ck, only 25.3%, we have got work to do batman! How did I come up with the 25.3%? Our Net Worth at December 2015 finished the year at $317,727. When you divide that into our cumulative earned income of $1,253,857, you get 25.3%. We didn’t start tracking net worth until 2012, which I suspect is the first year it went positive, but the good news is that this ratio has been improving. In 2012 we finished December with a net worth of $42,424 and our cumulative earned income was $698,884. This would have put what I am calling the Net Worth Conversion Ratio at a measly 6%. So, with that, we have made solid progress with the ratio up more than 4X in just 3 short years. Definition: The Net Worth Conversion Ratio measures an earner’s ability to convert earned income into wealth or net worth. It excludes passive income, since passive income is dependent on the earners decision of putting earned income to work or spending on consumption. – Earned Income: This part should be fairly obvious. You need an income in order to start building a positive net worth. Unless you somehow stumbled on some form of windfall through inheritance, lottery, or some kind of heist…you are going to need an earned income to get things started. – Debt: You are going to want to avoid consumer debt as this only causes your net worth to decrease. Every time you consume something you can’t afford today is stealing from your future self. Even the debt from acquiring a house (which I consider good debt in most cases) is dilutive to net worth and thus your conversion ratio. It’s not the face value of the loan, but the interest that erodes the net worth conversion ratio. This helps reinforce our goal of paying off our mortgage in 7 years, which will reduce the lifetime interest significantly. – Market Appreciation: When you put your money to work for you, you have the opportunity for appreciation and depreciation (to be avoided as much as possible). This is true whether you’re talking about real estate, stocks, gold, etc. Over a long enough time frame investments should go up over time. However, when you buy depreciating assets like cars, boats, and other toys, keep in mind that depreciation is eating your net worth for breakfast. – Passive Income: In addition to appreciation, you also have the opportunity to earn income in the form of dividends, interest, and/or rents from your investments. If reinvested this helps increase your net worth and improves the ratio without requiring you to earn more money actively. – Other People’s Money: The specific example I was thinking of when I added this to the list is rental real estate. You use the banks money to get a loan, and then you rent it out to a tenant and let them amortize the loan for you. You really get a lot working for you in this scenario. You have the opportunity for market appreciation, passive income, amortization of a loan, and tax perks…all of which will have a positive impact on your net worth and the conversion ratio. So, What is The Ideal Net Worth Conversion Ratio? 1 – Your Pre-Tax Savings Rate – For us that would be 37% based on 2016 projections. 2 – Your After-Tax Savings Rate – For us that would be 50% based on 2016 projects/goals. 3 – Equal to 100% – This essentially means you have been able to live and enjoy everything in your life for FREE. 4 – Financial Nirvana where Net Worth Conversion is greater than 100%. Ultimately, I think that everyone should aim to achieve at least a 50% conversion ratio. Personally, I am going to try my hardest to make it to Financial Nirvana, just because its sounds like such a magical place. I like the idea of generating wealth that is greater than lifetime earned income. I really think real estate could be one of the most powerful asset classes to help an earner move towards financial nirvana and a net worth conversion ratio of greater than 100%. All of the factors I laid out above are important, but this is one I will be giving extra attention to in 2016. After looking at this I really am feeling a stronger conviction on adding that 3rd property, but I want to make sure timing, price, and location is right. Getting all our ducks in a row if you will. I won’t go into the details now, but look out for future posts on this. What is your net worth conversion ratio? Are you where you want to be? I actually thought of this a few years back. I did add up all my earned income to get an idea were I stand on how well I was building wealth. I need to do this again, I’ll get back with you with my numbers. My earned income I believe wasn’t a good reflection of the money I was actually bringing in. For example I was enlisted in the Army. Only the base pay is taxable… But you get a lot of other special pay that is not taxable, for example housing allowances, food allowances, combat pay, hazard duty pay, airborne jump pay. All these extras could be as much as 100% of your base pay or more. After the army I was given VA disability, which brings me almost 21,000 a year as unearned income. So I’ve had a lot of unearned income over the years plus earned income. Now should I add in my unearned income plus earned income? Might not be easy to figure it all out since I didn’t keep every pay stub which included all these extra items since 2002. Hey Ap999 – Looking forward to hear where you are at. For your particular situation I would have considered the special pay in the earned income bucket. Not sure how I would handle the disability pay…probably would include that too, but it’s really up to you. If you don’t include it your conversion ration will obviously be higher. I think as long as you are consistent that is what matters most. Hopefully we will hear back from you soon. That’s an interesting way to think about it. I’m sure mine would be less than 25% right now, but it will creep up over time. Glad to hear you are making moves on more rentals! I definitely think it is the best way to build net worth over decades, which is how Gen Y should approach investing, not the quarter to quarter results of the stock market. Brian – We all have a baseline…doesn’t matter where you start, it’s all about making forward progress. On the rental front, had a few local deals sent my way that looked horrible when I put them into my model. But I didn’t expect much since they are California properties. The hunt continues. Might be soon that I will be ready for you to make some introductions. Glad to hear you aren’t going to settle for worse returns just because of where you live! Hi Dom, the exercise you undertook is great, and will be useful for future metrics on your income/savings/NW performance. I started keeping track of mine in the mid-90s, mainly to see what kind of salary increases I was getting in order to predict potential future increases. An easy thing to update yearly. As you can see, my first jobs were not well compensated (1983 had a 10.8% U3 Unemployment rate, would probably be 14% with the 2016 formula) and I felt lucky to have any job at all. Definitely a scramble. The thing is, most PF followers are aware that half of all U.S. households have a zero-to-negative net worth, and the median salary is >$30K; the hard part is getting past the ‘subsistence’ level where all one’s salary goes to taxes and living expenses. You and Mrs. GYFG have leapfrogged that ‘subsistence’ level quite nicely. My biggest takeaway from this, below, is that one needs to get-and-keep a job. Job loss, for any reason, for any duration, is a setback that should be avoided if you can. When one partner loses a job, it can change the entire dynamic of a marriage, too. The stress is not just financial. Anyway, continued success to you and Mrs. GYFG, every year you continue this path gives you a little more breathing room for life’s unintended events! Hey JayCeezy – Thanks for sharing your own earning history. Have you ever looked at your net worth as a % of your earned income? How did it look in the mid-90’s when you started tracking it vs. how it finished when you stopped working in 2013? Yes, I have, and it wasn’t a useful metric. The market returns have nothing to do with my income (i.e. the last five years of the ’90s had 20%+ returns, and I’ve been through brutal multi-year downturns). By 1995, I had 20 years of savings that were impacted by inflation (as high as 13% one year), tax rates (interest from CDs taxed as regular income, while stock market dividends and capital gains taxed at lower rates), etc. The savings rate was basically ‘as much as I could’, while the market returns were out of my control other than my choice for distribution. Your data points are very impressive, but when you have relatively few data-points, you may be seeing a pattern that isn’t really there. Your lifestyle expenses have increased, and a certain amount of that income has to service expenses and taxes so your savings is based on that income – expenses gap. Serious question, you are calculating a percentage, but what do you see that percentage indicating? Good? Bad? Neutral? Can you predict a future ratio from it? One thing about fewer data points now in 2016, is that there is a clear trend (upwards, great!) for both income and NW. The returns on your investment will not be so predictable always, and your income may flatten at some point. Continued success to you, GYFG! Hey JayCeezy – Is the percentage I calculated good, bad, or neutral? I would say it is good, but it could be much better. I made a lot of financial mistakes early on that impacted my savings rate, which ultimately impacted how much income I could convert to net worth. Of course no one has control of market returns, but over time the trend should be higher, at least that is the goal. Can I predict a future ratio? I think that I can say with a lot of confidence that as long as we ride this wave we are on that our ratio will continue to improve to at least match our 50% savings rate. And if we are prudent with putting money to work and letting other people put money to work for us (through real estate) then we should be able to work our way towards 100% over the longer term. Thanks for always asking these types of deeper thinking questions. You and Mrs. GYFG are definitely on a path that is one of choice, not accident, and will essentially guarantee the ‘risk managed’ outcome you have mentioned in previous posts. No matter your savings percentage (it is great that you calculate it, most people have no idea! ), it appears that you are turning on the afterburners now, so you can enjoy the benefits of your forward-thinking strategy much sooner than I (and many others) ever could. Always dig your ‘inside baseball’ mind and analysis! This is an interesting exercice to do. It creates a snapshot of how well you have been saving over the past years. To balance the outcome, (only 25 pct as you say yourself), it might be worth the effort to balance it with the experience you have had. Just as a way to provide perspective to the number. There are always context metrics and explanations to go with all metrics. I am just glad I started tracking now vs. 20 years from now. Much easier to manage and effect change on what you measure. Funny – I think you and I had a chat about this in comments about 6-9 months ago. I’m not sure how to check my comment history, but I believe I already left me “net worth conversion ratio” in that comment! Nice job, and with a savings rate as high as yours, this number will certainly creep up over time. Yes, with much larger incomes and a much higher savings rate, the weighted average will continue to rise significantly towards that 50% mark. Beyond that, our investments are going to have to help get us beyond the 50% mark, unless we are able to increase our savings rate. This is awesome. Thanks for the post. I’m going to see if I can pull up my history — without looking I’m pretty certain my historical ratio is well below 50%… Agree with you on making it to 100%. That’s my goal as well, only hoping to build enough wealth to live off the dividends / passive income. Glad you liked it lifetimeandmoney! Would love to hear where you are at once you pull all your numbers together. Definitely a good exercise worth taking. I just got my SS e-mail reminder to check what my earnings are and I guess my ratio is anywhere from 110% – 165%, depending on the value of my online business. The ratio increases MUCH more rapidly the wealthier you get in a bull market as earnings become less of a factor in building wealth. e.g. $5M net worth that grows by 10% is $500,000 > than a $200,000 salary. Sam – you are a wealth building beast! Thanks for sharing your own ratio. Now between you and Michael I have some milestones to chase. Totally agree with the dynamics of this ratio during a bull market. How long did it take for you to get over 100%? Interesting ratio Dom! I had to dig up my SS statement, but combined with my wife’s income, we’re sitting at 86%. In a way, this should probably be lower as my partners and I would take distributions of profit over high salaries some years. Oh well, it’s interesting to look at nonetheless. Now you and I both need to chase Sam! Neat way to look at things. When you are converting earned income, are you looking after tax dollars? Here in Canada, the taxes are much much higher. Using after tax dollars for earned income is a much more accurate way of determining purchasing power. I’m around 108%-110%. And with opening a small business, my taxes are much lower now..
With your massive earning income and no kids (I assume), you are on a fast track to reaching Financial Nirvana. Hey Tracy – The income used here is actually gross income and NOT after tax dollars. Our conversion ratio would be much higher if it was based on after-tax…but the idea is to essentially build a nest egg that not only fully provides for you every need, want, and desire. But imagine having earned $5 million dollars and having $5M in cumulative assets (real estate, stocks, etc). You essentially have lived for free. Now that we are so focused on these things and have taken many steps in the past 2 years to optimize our financial situation, I agree that we should be on the fast track to financial nirvana. No kids definitely helps…but they are in our future…probably a few more years away though. Oh I get it. Similar to Tony Robbins definition of ‘financial freedom number’ or ‘absolute financial freedom number’. In that case, I’m only around 74%. Great way at looking at things! J$ does this posts this annually on his site http://www.budgetsaresexy.com/2014/11/total-lifetime-earnings-wealth-ratio/ so you may have seen it there. go curry cracker also had a post on this once.. their ratio exceeded 100% due to being retired in a bull market with low spending. Don’t forget I’m much older, so my achievement is not that impressive. I think I took about 10-13 years to get to 100%. Interesting way to look at things and not something I have thought of in the past. We are currently sitting at about 34%. But like the Millionaire Next Door formulas for under/over accumulator of wealth, I think it has to be taken with a grain of salt in someone’s 20s and/or early earning years. I don’t see us realistically getting above 45% by my 30th birthday, but hope I’m wrong there. At the moment, our income is just simply currently outpacing our net worth growth, year over year. Based on my current estimate, we are currently probably looking at reaching 90-100% in mid-to-late 40s. Gotta crank up that side income to get us there in our 30s – challenge accepted! TFG – 34% is good man! Hi, I have been a regular at your blog for 2 months now and this is my first comment at your blog. Even before I get onto this topic I would like to extend my thanks for your ‘ start a blog page’. It took me 2 months to decide on starting a blog, but just 5 mins creating it using your step by step procedure. On to this topic, I did prepare a similar chart for myself a couple of weeks back. The ratio was certainly low. During the initial stages all of the income was spent on day to day expenses. But as the income grew, the spending were more on depreciating assets like cars etc. It’s been only over the last few years after eliminating wasteful expenses, paying up my car loan and investing in equities have I seen my networth increase. Hi Santosh – Welcome to the Personal Finance Blogging community. Glad my “start a blog” resource was so helpful. Here is to a prosperous and fulfilled future!!! Pingback: Income Tracking - Where did it all go? What do you and your wife track combined and what do you track individually? I am having a hard time tracking spending, net worth, etc. between my fiance and I. I’m thinking of just moving to joint accounts to avoid the hassle. Millennial Boss – The only thing that we track separately is our income. We joint accounts on all accounts that are eligible. What makes it super easy for us is that we use personal capital to aggregate all of our accounts in one place. I don’t see a lot of value in tracking who spent what or tracking separate net worth. We are married so therefore anything either of us have individually is OURS!!! Your situation probably gets cleaned up once your married and you combine everything. I know some people that don’t combine everything, but to me that is just crazy. We like to keep things as simple as possible.